A great set of guitar-based sounds for your arsenal. This 24GB 'textural' sampled guitar library is split into five categories, each with a scripted engine. Swells are major and minor strummed chords, with envelope/LFO modulation plus supplementary chromatic single-note patches. The Pads engine mixes two pad layers from an extensive menu of samples, again with envelope and LFO modulation of each. Ambient Designer is the highlight, enabling incredibly intricate beds and ambiences; and Latch mode, per-group mixing and one-note "Full Mix" playback make sound design fun and productive. Finally, the Phrase Builder and Instruments categories contain a range of performed phrases and multisampled guitars. 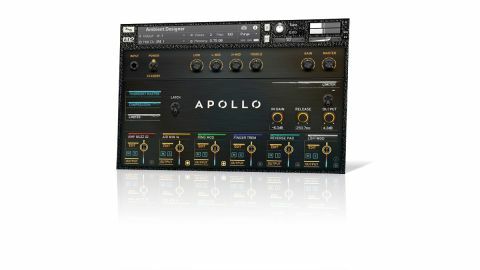 With a decent set of effects onboard, an Amp Head section for easy EQ and volume control, and, most importantly, fabulous recordings at its heart, Apollo gives the ambient/ chillout/soundtrack producer a source of deeply manipulable guitar-based sounds that are endlessly diverse and expressive.